HTC teamed up with Olympic Medal winner Diver Tom Daley to promote its recently launched Flagship device HTC U11. The 23 year old British diver tried to take “the most extreme selfie” with the help of Squeezable feature of HTC U11 at the London Aquatics Center which company calls the first ever selfie during a reverse rotation ‘gainer’ dive. There is no doubt, these kind of things wouldn’t have been possible without the pressure-sensitive (Squeezable) edges of the HTC U11, that allow its users to easily open various apps including camera by simply squeezing its edges, that helps users to take selfies from places and angles that were never before possible, without unnecessary fumbling to reach the selfie button, or dropping the phone whilst posing. 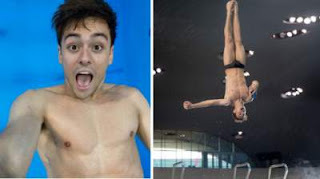 Company reveal that, Tom took few hours to master the prefect the perfect diving selfie after practicing from a variety of heights, including the ten-metre diving board and one metre springboard. The slower rotation of the ‘gainer’ dive - the acrobatic trick of performing a backwards somersault while still moving forward - from this height allowed Tom to make the most of the HTC U11’s squeeze functionality and produced the most Instagramable pool backdrops. This is the first time that any photography of this kind has been taken at the famous Olympic swimming venue. Flashing Light on this achievement Tom Daley said “I love taking a selfie, so when the challenge arose to try and take one, and capture myself mid dive, I obviously jumped at the chance. The HTC U11’s amazing ‘squeeze to selfie’ function made this possible, and might even be a world first! It took a few attempts to perfect my dive, but after a few belly flops I got there. I have to say the final photos are easily some of my favourite diving shots ever”. As a quick reminder, HTC U11 sports a 5.5-inch Quad HD (1440x2560 pixels) Super LCD display with Corning Gorilla Glass 5 protection on top. It is powered by Snapdragon 835 processor the 2nd most powerful & latest processor from Qualcomm family coupled with 6GB of RAM and 128GB of native memory. HTC U11 runs on Android 7.1 Nougat with the company's HTC Sense skin on top. For Photography, It features a 12-megapixel rear camera with 1.4-micron pixel, ultra speed autofocus, BSI sensor, OIS, f/1.7 aperture, dual-LED flash, slow-motion, and 4K video recording. On the front it offers 16-megapixel camera with BSI sensor, full-HD recording. Few notable rear camera features are Face Detection, Pro mode with manual control, 32-second long exposure, and RAW format support, HDR Boost, Panorama, and Hyper lapse. Under the Hood, HTC U11 offers a 3000mAh battery that comes with an extreme power saving mode, and Quick Charge 3.0 support. The HTC U11 is a Amazon India exclusive smartphone and it also available offline retail stores in India in Amazing Silver and Brilliant Black colours for Rs 51,990 Only.